It's here. The "10 Rules for Dealing with Police" DVD. Donate $30 or more and get a free copy mailed within one week. From the creators of the classic, Busted: The Citizen’s Guide to Surviving Police Encounters (2003), our friends at the group Flex Your Rights are now releasing their new achievement, 10 Rules for Dealing with Police. Because StoptheDrugWar.org (DRCNet) members like you supported Busted, you've earned the first chance to see this important new DVD. 10 Rules for Dealing with Police, a 40-minute educational drama, is the most sophisticated and entertaining film of its kind. 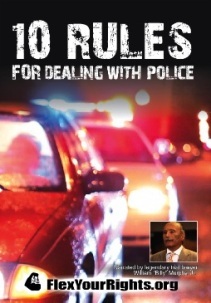 Narrated by the legendary trial lawyer William "Billy" Murphy, Jr. (from HBO's The Wire), 10 Rules depicts innocent people dealing with heavy-handed policing tactics used every day in the United States. Through extensive collaboration with victims of police abuse, legal experts and law enforcement professionals, Flex Your Rights has developed a powerful multi-language (English, Spanish & Arabic) resource that provides proven survival strategies for dealing with racial profiling and police abuse. Do you know what your rights are if you're stopped by police? Most people don't, and the consequences can be severe. From simple misunderstandings to illegal searches and excessive force, a bad police encounter can happen to anyone. But after watching 10 Rules for Dealing with Police, you'll be more confident and better prepared to handle every kind of police situation. We still offer Busted on DVD, too. Add $25 to your donation for a total gift of $55 and get both videos: 10 Rules AND Busted. Or get two copies of either DVD for $55. It's your choice. 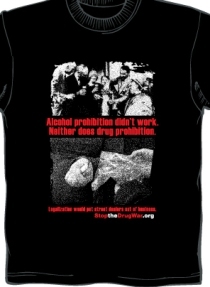 You can also add BOTH of our popular anti-prohibitionist t-shirts for your donation of $100 -- a terrific value while you support the important work of StoptheDrugWar.org. Get yours today! StoptheDrugWar.org is the #1 source for the latest news, information and activism promoting sensible drug law reform and an end to prohibition worldwide. 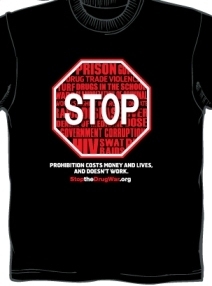 With 1.8 million unique readers in 2009 and with leading news and commentary sources making use of our web site on a regular basis, StoptheDrugWar.org is advancing the drug war debate and growing the drug policy reform movement, helping to start or spark the creation of organizations like Students for Sensible Drug Policy, Flex Your Rights and many others. Our strategy is working, and your generous donation will make a difference during these economically challenging times. Thank you for helping -- we look forward to sending your copy of 10 Rules! StoptheDrugWar.org is the #1 source for the latest news, information and activism promoting sensible drug law reform and an end to prohibition worldwide. Your donations support our work of building the movement and fueling the public debate! "The 4th Amendment has been on life support during both the Bush-Cheney and Obama administrations. The clearest and most constitutionally-grounded guide for all of us against this government contempt for our 4th Amendment rights is 10 Rules for Dealing with Police. It should be shown in schools, in local legislatures and in Congress. "10 Rules will educate all individuals about how to safely exercise their rights and protect themselves against abusive and illegal police behavior. It should be required viewing in high schools across the country." "Chronic disregard for civil rights is tearing apart the fabric of America. Flex Your Rights has hit the nail on the head in this hard-hitting instructional video." "I believe 10 Rules will make an extraordinary contribution to the cause of social justice. Only those police officers who disregard the law have something to fear from its message. As an ex-cop, I thank Flex Your Rights for all you've done and continue to do." "I read the 10 Rules screenplay and am thoroughly pleased. It is well written, and I believe it realistically and fairly grasps the issue of racial profiling. Go forward!" "10 Rules is an outstanding screenplay that resonates with authenticity, ripples with humor, and draws blood with its pointed examination of law enforcement in our cities. America's urban youth will love this movie, which talks straight and provides crucial, relevant advice on how to use America's unique Constitutional protections. Two thumbs up." "Good community policing is impossible when officers disrespect constitutional rights. 10 Rules will help citizens understand their rights and ensure that law enforcement is professional and accountable to the public."